Find out what NIE numbers in Spain are, why you need them and how to get them. You may have heard about these strange things called N.I.E. numbers. They might sound mysterious to the non-Spanish but they are simply a number that is assigned to foreigners who have assets in Spain, both residents and non-residents. You need this number for many procedures, including opening a bank account (resident or non-resident), buying a car, even, on occasions, accepting a package through the postal system. The actual N.I.E. 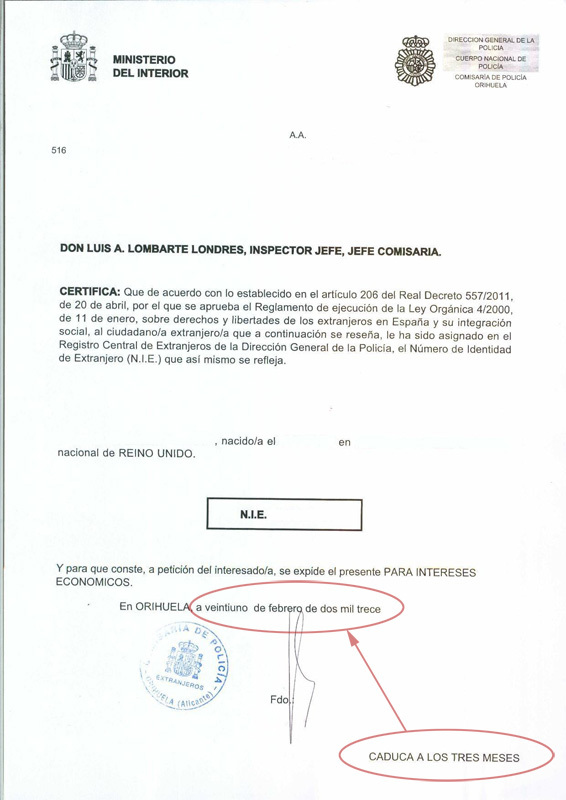 number, when produced from a National Police Station in Spain is printed out on a piece of paper, along with a stamp and signature provided by the National Police and this sheet of paper is often used as a form of identity. Once you have been issued an N.I.E. number, it is yours for life, although this paper certificate is only valid for three months from the date of issue. Although largely ignored by the vast majority of foreigners up until the year 2005, the National Tax Identification number of Spain has been a requirement for all individuals conducting any type of business within Spain that involves purchasing or selling any items. The Spanish government have linked the N.I.E. number to various other departments such as the Social Security and residence (e.g. including the N.I.E. number on the tarjeta de residencia - residence card). Whilst it is possible to obtain an N.I.E. number via the Spanish Embassy, or using Power of Attorney, the simplest way to to do it in person when you are in Spain. This normally involves queing outside the Police Station to sumbit your application having filled in the form and having your passports and photographs ready. You will be told the number there and then but, you would have to go back at a later date to collect the certificate. It is also necessary to register the number with the tax office and the fee must be paid over the counter at a bank to obtain proof of payment. If you have any queries, please get in touch and we will help you as best we can.